I’m installing a transmission to a block that are not original to each other. My gap currently is .020 on one side and down to .010 on the other. What’s the best way to get to the desired .025. - .040 ? You need to install shims between the field coil ring mounting locations and the block to get the required clearance around the entire ring. Originally most cars were fitted with a once piece steel shim, to set a uniform gap, but you may need to use the peelable brass shims in different thicknesses to make up for irregularities in the castings. Also make sure to check that all of the magnet surfaces are set to the same height and that the poles on the field coil are all relatively the same. If not, you may need to get the pole faces surface ground to make the job go easier. The Ford service manual explains the process of adding shims in detail. Installing shims will only close up the gap. If you that little clearance more than likely your rear main cap thrust is worn beyond specks. You can check this by by leaving the motor-transmission in the vertical position and placing a jack and wooden block under the crankshaft. Carefully jack it up and recheck the clearance. If this gives you clearance you will need to remove the the rear cap and build up the thrust. Call me at 903 824 1949 if I can help. If you have, If you have!!! Sorry, there is no fix for my stupid. The Ford Service book Page 85, paragraph 319, the distance from the face of the crankshaft flange to the face of coil cores should be approximately be 27/32'' or 0.8437. Mike - You’re right. I wasn’t thinking clearly and probably told Robert something he already knows. Thanks all. I did the jack method to check for end play. All measurements were good. I’ll order 4 shims, I believe that will resolve the issue. It should be a good work out. Robert, if you shim one side to open the gap, the other side will close some. You may need to do some juggling to get the correct clearance. Be prepared to do some heavy lifting. 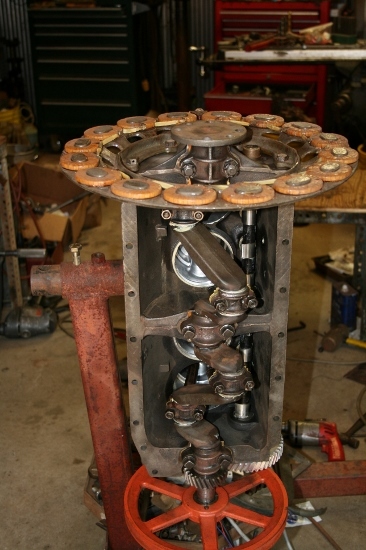 Each adjustment requires lifting and replacing the transmission. Have you watched Mike Benders excellent video on how to set the clearances? Can't send you to it directly, but Google Mike Bender Model T tips and wander around till you find #14 flywheel and field coil. You will probably spend a few hours watching his other videos too. I was thinking that I was going to have to file the bosses on the back side of the field coil ring and use shims for the fine tuning. But after watching Mikes video, I had an ooh moment. Pictures are worth a thousand words, especially moving pictures. Follow up on this thread of progress. I filed the bosses down .020. I have 3 plates that are high. I’ll beat/ tap them with a brass hammer, then shim for fine tuning. I’m not willing to spend 200 on a tool yet. No, I don’t have brass feeler gauges. Meanwhile, messing with a Bosch du4. Seems like magneto teach an idiot week for me. You should never have to file the bosses on the coil ring. You have other issues if that is the case. I agree, Dan. That shocked me. I have never heard of anyone filing down anything on the magneto to adjust it and .020 is a lot to file off, but the deed is done. If I understand what has been posted your gap was .020 and .010 when you posted. Were there any shims in place when you did that measurement? If not any shims, then adding shims will close the gap even more. The measurement should be made with the engine supported nose down and the crankshaft free to move down toward the front of the engine. If you have .020 and .010 when it is in that position, but when you jack up the crankshaft, you have a greater clearance, your rear main cap needs to be built out to hold the flywheel farther away from the block. If your measurement was made with shims in place, remove shims to obtain proper clearance. If the clearance is too close, you run the risk of damaging the magneto and possibly throwing one or more magnets loose from the flywheel. Some crankshaft grinders true the end up in a lathe to ensure the flywheel has the same spacing all the way around. That will then sometimes require a circular shim, with 6 holes cut in it, to fit between the flywheel and crankshaft mounting flange. Then you still may need a few shims between the Coil Ring and the Engine Block for a uniform spacing, but not always.